The symbol for this product type is All Liquids - Yellow Triangle. The symbol for this product type is Oils - Red Circle. Critical Factor - Response time is the critical factor in spill management. Every minute a spill is left uncontained, the risk of slips, falls or environmental damage is increased. INTEGRITY SPILL KITS provide quick, effective and practical initial response. The smaller spill kits fit easily under a seat or in a small storage area...ready to provide quick, safe cleanup of smaller spills and drips before they become a larger problem. Options - We have thirteen, pre-packaged, standard spill kits. Six of the thirteen are designed specifically for hydrocarbon recovery. Should the standard configuration and/or materials content of these kits not meet your needs, we would gladly customize a kit for you (at no extra cost per content piece). The symbol for this product type is Oils - Red Circle. The symbol for this product type is All Liquids - Yellow Triangle. Emergency Response Spill Kits are useful in many places. The smaller Spill Kits fit easily under a seat or in a small storage area...ready to provide quick containment and clean up of smaller spills before they become an even larger problem. 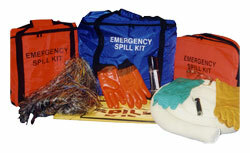 Read more about Integrity's Emergency Response Spill Kits. Regardless of your spill management needs, there is an Integrity Spill Response kit that's just right for you, whethter it is our smaller Spill Kits or our Large & Extra Large Spill Kit. From our small gallon capacity kits to our extra large volme capacity kits, you'll find a spill kit to meet your needs. Custom kits can be assembled as required. Read more about Integrity's Large & X-Large Spill Kits. Download a pdf document containing a detailed description of the contents of various Large & X-Large Spill Kits here.